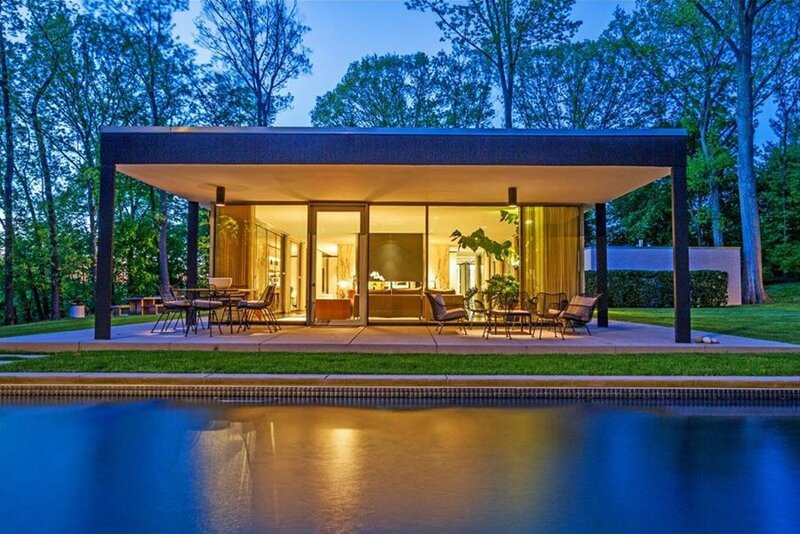 The international style is alive and well in this lovely original mid-century house. 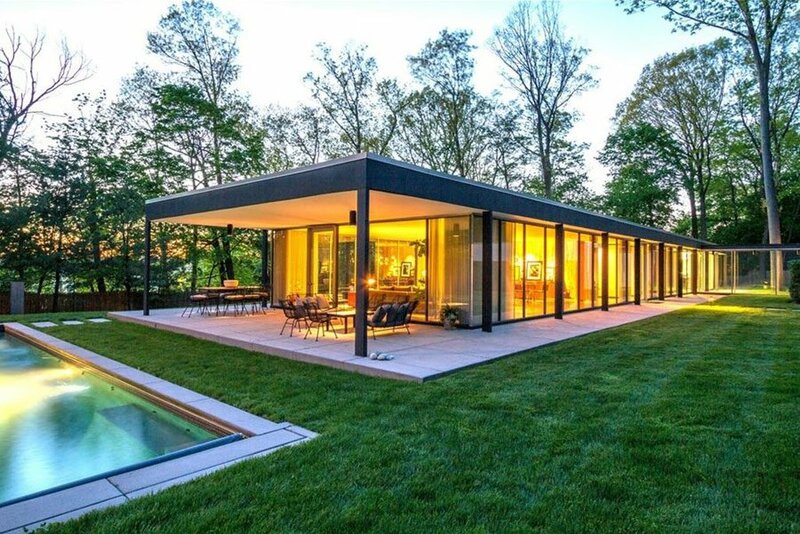 Located outside New York City, it was built in 1957 by architect Roy O. Allen, a partner at the firm Skidmore, Owings & Merrill. Allen built the home for himself, and lived there for a decade before moving on. It really bears the look of an owner-built house: lovingly thought-through and full of idiosyncrasies. 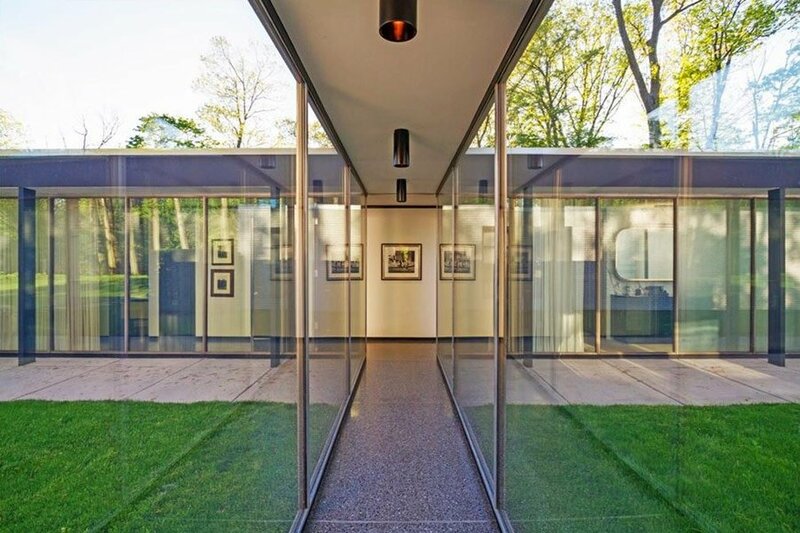 Among the more curious features of this house are its passageways. 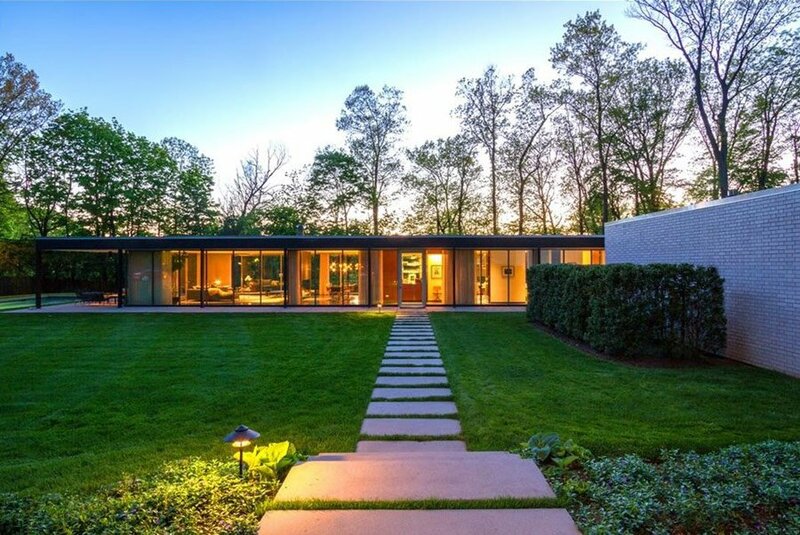 One long corridor runs through the garden, connecting two parts of the house together with floor-to-ceiling windows all the way along. This has the delightful effect of placing the outdoor environment squarely inside. 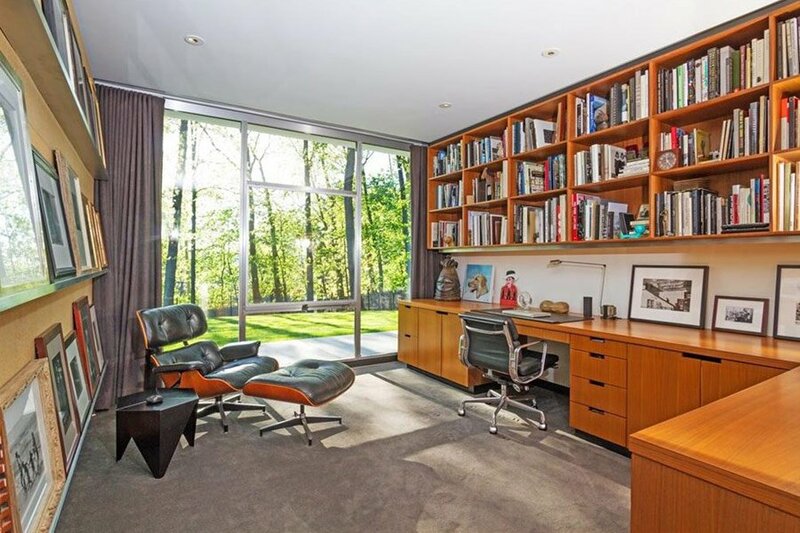 As with many homes built in the international style, there is quite an office-like feel to this house. 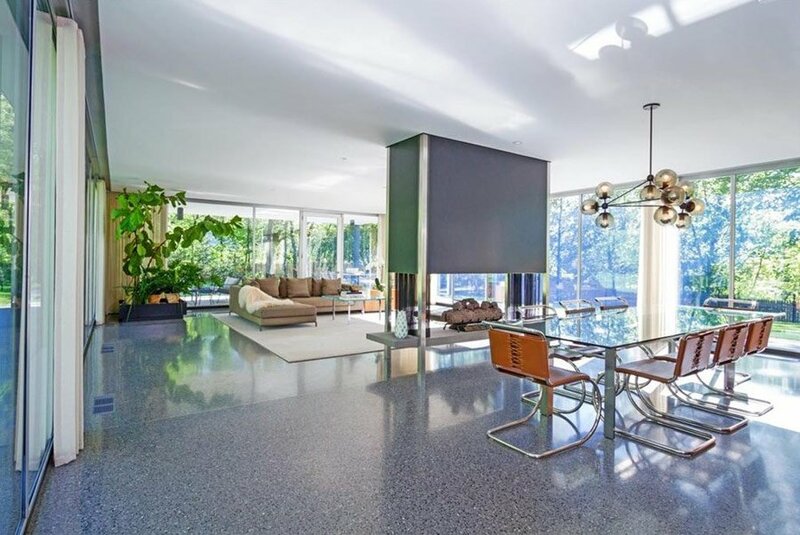 This is most clearly expressed through the presence of terrazzo floors which run throughout. These floors are paired with the bare minimum of detailing. The frames of the many windows are a case in point, just clean stainless steel, and barely noticeable. 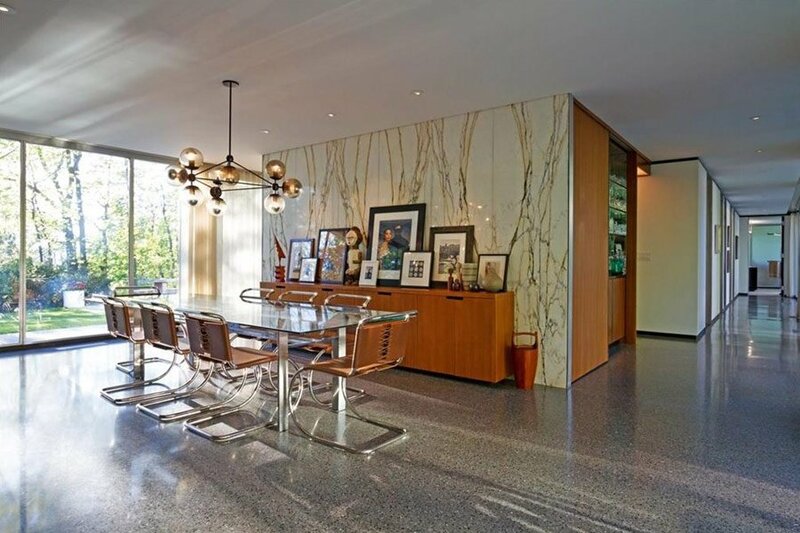 Likewise, the dining table is very simple, and certainly wouldn’t look out of place in one of those 1950s boardrooms with which the international style is most associated, what with its Marcel Breuer tubular steel chairs and glass table top. Near to the dining table is the double-sided fireplace. 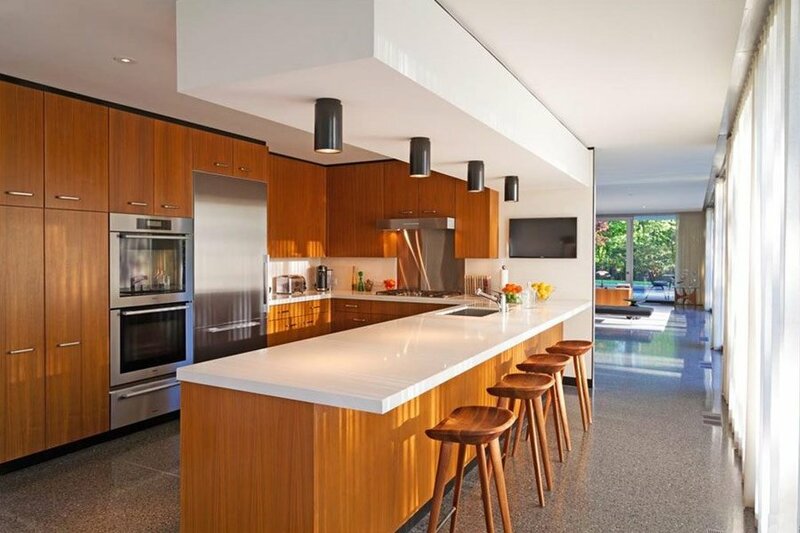 Along with the terrazzo flooring, this fireplace was added by subsequent owners, in a renovation which only enhanced the authentic international style design. Indeed, such a style of fireplace is a far cry from the solid, rustic fireplaces you might see in Frank Lloyd Wright houses, or some other more nature-oriented mid-century home, but it really fits in nicely in this space. Speaking of which, both dining table and fireplace are housed in a vast central living area. There are almost no walls in this room, instead it is bordered by those floor to ceiling windows. Meanwhile, the only wall to speak of is clad in a beautiful white marble. All in all, it’s a pleasure to behold.